Clear golden color with moderate activity and a haze of yeast. Slightly creamy and frothy beige 2-3 finger head, lasting around 10 minutes, with serious legs and a good swirl effect. Flavors of pineapples, mangos, grapefruits, lemon, caramel, sweet grains, ginger, wild yeast, floral hops. Smooth oily full body with a moderately sharp crisp. Medium strength finish, highly tropical and sweet, ending with flowery dry hops. Slightly tongue numbing, still pretty accessible and well intensified. Impressive pale ale that is close to the line of an IPA, while still remaining true to the style from a highly balanced finish. Gets a bit more intense with the yeast, more citrusy with almost Saison qualities. Good freshness and filling, yet delicately super well rounded body. Overall excellent quality craft. Appearance - Pours an amber colour with two fingers of frothy white head. Smell - Bready malts, grains, caramel, floral hops, slightly soapy aroma. Taste - Mainly bready malts and grains, along with mild bitterness from the floral hops and a touch of caramel and soap. Almost tastes like a hybrid of a blonde ale and an APA. Mouthfeel - Medium bodied with moderate carbonation. Finishes with a lingering hop bitterness on the palate. Overall - A unique brew that displays elements of an American blonde and American Pale Ale. I was expecting more hop forwardness, but regardless, it is quite enjoyable. I do not detect any simcoe in this beer at all. High clarity, golden in color, white head, earthy bread crust aroma. Nothing offensive in this, definitely a well made beer but by the time it arrives in Calgary it has lost whatever sets it apart. 650ml bottle - wow, it took them long enough to get this one over the Rocky Mountains to we Albertan fans after the release announcement, eh? This beer pours a slightly glassy, medium golden amber colour, with three very Rubenesque fingers of puffy, loosely foamy, and fizzy off-white head, which leaves some random sudsy island group lace around the glass as it evenly sinks away. 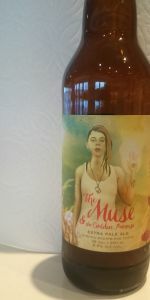 It smells of bready and mildly doughy pale malt, light orchard fruit (think underripe pears and white grapefruit), somewhat musty yeast, a tame earthy chalkiness, and further leafy, piney, and floral hop bitters. The taste is gritty, grainy and sort of biscuity pale malt, acerbic pome and generic citrus fruit esters, a steady undead yeastiness, and more leafy, weedy, and grassy hoppiness - the slightly elevated ABV having no say in the matter so far. The carbonation is quite active in its probing and otherwise supportive frothiness, the body a decent middleweight, and generally smooth, in a breakfast cereal sort of way. It finishes off-dry, the lingering complex graininess watching the attendant green and citrusy hops start to struggle to pull their own weight. Overall, a well-made blend of New and Old World ingredients - the British malt, the Yankee yeast, and the (Canadian?) hops. At any rate, this is a pleasantly engaging blonde ale, something that I am historically not accustomed to uttering. But, aren't muses good at influencing that sort of thing in the first place? Poured from a 650ml bottle, 6.5ABV, 35 IBU, Golden Promise Malts, California Ale Yeast, Simcoe Hops. A: Pours a nice Clear Light Gold with a nice white head that stays and good sticky lacing. S: Mild hops on the nose. T: A crisp light Pale Ale with hops in the background. F: Clean on the palate nice carbonation well balanced with hops and malts. O: A good easy drinking Pale Ale. Nice work.